[UPDATE 1.1.3] This version brings significant enhancements to the EX_Servo class to allow asynchronous and simultaneous motion by multiple servos. Also, the speed of each servo, as well as min and max endpoint angles are now user selectable. Special thanks to @VooDooFiveTwo Jeff Albers for his contributions! [UPDATE 1.1.2] I have added I2C sensor support for the MAX44009(lux), TSL2561(lux), BH1750(lux), AM2320(temp and humid), BME280(temp, humid, pressure), BMP280(temp and pressure), and updates for the TCS34725(color lux). A new example sketch to demonstrate these is included as well. HubDuino allows you to integrate a custom Arduino / ESP8266 / ESP32 device with Hubitat by editing only one Arduino sketch file! No groovy programming skills are required! You simply decide what devices are attached to each pin of your microcontoller and HubDuino/ST_Anything handles the rest for you! Numerous example sketches are included to help get you started. Please provide some feedback on your experience so the documentation and code can be improved. Note: This release has support for LAN-connected devices AND for the ThingShield. 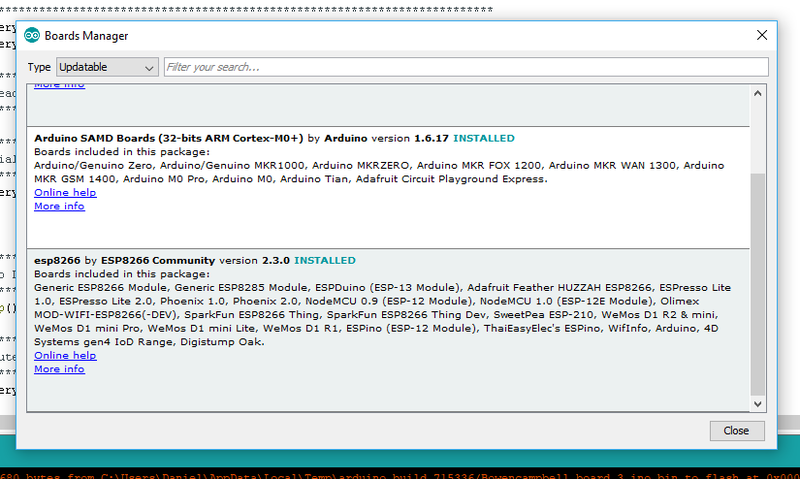 Note: Former ST_Anything users will need to update all of their Arduino Library code from my GitHub repository. Some minor changes were required to the Ethernet/WiFi libraries. Also, the Hubitat Hub listens on port 39501, not 39500. You will need to update your sketches accordingly while changing the IP address of the hub as well. Please follow the guide in the ReadMe below and feel free to issue a pull request to improve this document. **WARNING** - If using an ESP8266, make sure you are using v2.4.2 of the Arduino ESP8266 Board manager (v2.4/2.4.1 introduced a memory leak causing ST_Anything to crash after an hour or two) along with Arduino IDE v1.8.8. - 2019-02-10 HubDuino v1.1.3 - Significant overhaul of ES_Servo class and Child Driver - Thanks Jeff Albers! Note: The HubDuino v1.1.3 release is based on the ST_Anything v2.9.3 baseline and was built using the Arduino IDE v1.8.8. Please make sure to upgrade your IDE. Turn your Arduino UNO/MEGA/MKR1000, NodeMCU ESP8266, or ESP32 into Anything you can imagine! 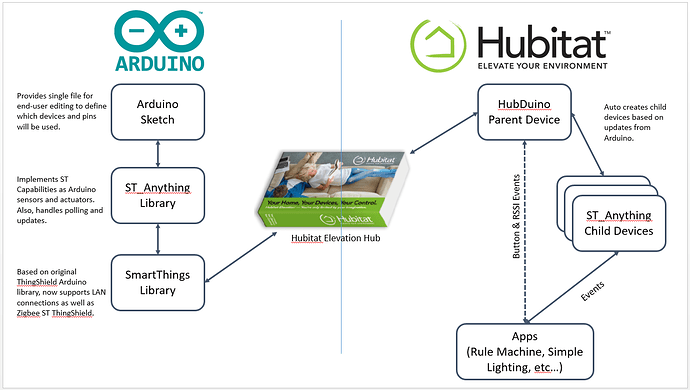 HubDuino/ST_Anything is an Arduino library, sketch, and Device Handlers that works with your hardware to create an all-in-one SmartThings device. NOTE: The v2.4/v2.4.1 ESP8266 Board support package for the Arduino IDE has introduced a nasty memory leak. Please be sure to revert back to v2.3 OR use v2.4.2 to prevent your ESP8266 from crashing every few hours. This is an issue that the Arduino ESP8266 developers are aware of and appear to now have corrected in v2.4.2 of the ESP8266 Board support package. HubDuino - Arduino / ESP8266 custom integration is working! How do I interface 802.11 WiFi-enabled devices? Migrating from SmartThings to Hubitat, best practices? I was able to replicate the setup from ST very easily on a separate nodemcu much easier than anticipated. I now have a “hubduino” set up communicating motion status locally and real time to my brand new Hubitat hub. Thank you! While motion sensor works excellently, I haven’t been able to get any switches to operate. I have tried a relay as well as RF24 transmitter (works in ST). I do see in the hubduino logs that it receives the commands but the power state on the nodemcu doesn’t appear to trigger and nothing is updated in the Hubitat portal. Did I miss a step in configuring to make it respond to the commands? Apologies for the confusion - thank you! Glad to hear you’ve got it up and running. Please let me know if you have any feedback, especially in the documentation. I have added support for the ThingShield. If you give it a try, please post your results back in this thread. I assume the tile layout for devices is different in Hubitat? I don’t see the option to enter a temperature offset in my child temp devices. That’s a very good point! Let me take a look and see why those options are not showing up! First, thank you very much for the feedback! Please give this version a try and let me know if it resolves the missing preferences issue. *    2017-08-23  Allan (vseven) Added a generateEvent routine that gets info from the parent device. This routine runs each time the value is updated which can lead to other modifications of the device. *    2018-02-16  Dan OGorchock  Fixed preferences to work with Hubitat. //input title: "Temperature Offset", description: "This feature allows you to correct any temperature variations by selecting an offset. Ex: If your sensor consistently reports a temp that's 5 degrees too warm, you'd enter \"-5\". If 3 degrees too cold, enter \"+3\". ", displayDuringSetup: false, type: "paragraph", element: "paragraph"
//input title: "Temperature Unit Conversion", description: "This feature allows you to select F to C, C to F, or no conversion", displayDuringSetup: false, type: "paragraph", element: "paragraph"
Thanks for the feedback. I tested it on ST as well and all appears to be fine. I have updated my GitHub repository. I noticed today that HubDuino was throwing some errors in the Live Log regarding a function called ‘sendEthernet()’. This is a function that is internal to the “HubDuino Ethernet Bridge” and “HubDuino ThingShield Bridge” Drivers. It is called by the HubDuino Service Manager whenever data needs to be sent to the Arduino processor. So data was coming into Hubitat, but could not be sent to the Arduino. I believe a recent Hubitat hub firmware change may have changed the behavior for how an App can call into a Device. I had to declare ‘sendEthernet’ as a custom “command” in my Bridge Drivers. Then the problem was resolved. So, heads up to anybody using HubDuino. You may want to update your Hubitat-side groovy code. I have been continuing to add to ST_Anything for both SmartThings and Hubitat, so there are some additional features that have been added over the past few weeks. I was about to add a NodeMCU to my Hubitat tonight . I already did the ST_Anything with one a couple weeks ago and was meaning to send you a thanks for that. The ST_Anthing was only my 2nd Arduino project ever. Up to that point I did everything with Rasp-Pi’s since they 1st came out. Thank you for your codes and keeping us updated. Installed everything as per instructions but in section “Verify you Child Devices are automagically created” I do not see the child devices in the devices list. Yes, Bridge is but no children. Went back and double checked everything that I did and what I think I did right but here I am at this point. Any ideas for me to look? Double check the MAC address that you entered into the Bridge device (assuming you’re not using a ThingShield.) All uppercase and no delimiters. Also, you did install the HubDuino Service Manager app and configure it, right? Check the Live Logs for both the Bridge a Device and HDM App to see if any data is showing up. Rebooted Esp8266 and they started to show up. Could be my learning curve and patience (or lack of) kicking in. Will this need a watchdog to prevent falling asleep? I didn’t do anything like that with the ESP8266 I have on my ST hub. Why I ask is that before I restarted the Hubitat ESP8266 it disappeared from my network. I will wait and see if that happens again. Thank you again. (Hope you never get tired of all the people thanking you). I have never had an ESP8266 go to sleep running ST_Anything’s example sketches. Seems ok now, probably just the reboot of the Arduino. @ogiewon do you happen to have a spare ThingShield? I am working with a @Matthew to move his alarm panel integration over to Hubitat and he cannot pair his ThingShield to Hubitat. I have a spare Arduino and ThingShield and I tried pairing it this morning with no success. I am on the latest firmware and discover never finds it. Last weekend my ThingShield was found immediately so not sure if something changed in the latest firmware but I am hoping someone else can validate this. Thanks in advance! I just removed/unpaired my ThingShield from Hubitat, performed the reset of the ThingShield by holding down the SWITCH button for 6 seconds, then put Hubitat in device discovery mode, and then pressed the SWITCH button one time on the ThingShield. It was discovered almost immediately as a “SmartSense Multi Sensor” (or similar). I then changed the Driver to my HubDuino ThingShield Bridge and it seems fine. I am on 704 firmware. OK thanks for validating. I seem to be having troubles discovering ST branded devices lately. I paired a smart power outlet today and it took over 2 minutes to show up. My water leak sensors were super frustrating last weekend. But Iris contacts pair almost immediately.